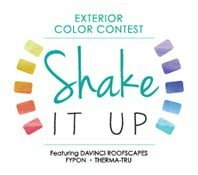 Congratulations to Rachel Delgado of Hampton, Virginia, who was the winner of our 2015 “Shake it Up” Exterior Color Contest, sponsored by DaVinci Roofscapes! Rachel will receive a $2,500 cash prize for having the most votes from viewers of the before and after pictures of her house posted on our website. The “after” picture of Rachel’s house is an artist’s rendering based on color changes and other improvements mentioned in her essay on how she would like to improve the color and look of her house with recommendations by Kate Smith of Sensational Color and using products made by DaVinci Roofscapes, Therma-Tru, and Fypon. 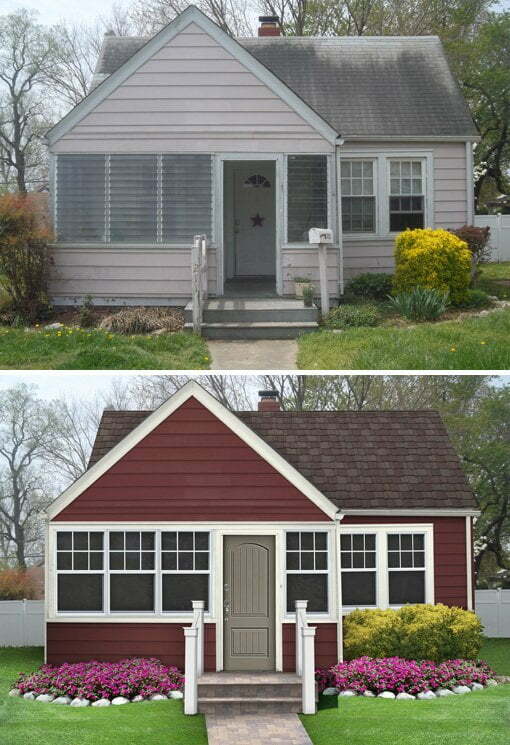 Below is the essay Rachel wrote to enter the contest, and the before and after pictures of her house. Throughout college I always said I was going to get chickens and renovate the house after graduation. I’m proud to say that I am graduating and ready to do both! Since I already have a pot belly pig, I want to “shake up” my home by going with an urban farm/rustic chic theme. The exterior will be painted barn red with white trim. The old paint would be removed from the porch to allow the wood to show with a stain matching the doors for protection. As you can see the porch door blew off during a storm so I would like to put something more durable up. Therma-Tru’s 2/3 lite one panel plank with clear glass would be a sturdy alternative that would go great with the theme. Therma-Tru’s two panel plank soft arch front door would be the perfect compliment to that for our front door. I would also use Fypon’s QuickRail in white to replace the broken/paint chipped porch railing I have now. To top it off DaVinci Rooftops makes roofs with a rustic flair. The multi width shake in brown stone would add the perfect finishing touch. Visit our Giveaways page to find out about any other contests, sweepstakes, or giveaways that are currently taking place. 2015 Door Do-Over Sweepstakes Winner!